Irish software company Enverian, which develops systems for the energy sector, has announced a €1m equity investment which will result in the creation of 18 high level IT jobs. The investment was made in a first fundraising round by the AIB Seed Capital Fund, which is co-managed by Enterprise Equity Venture Capital, Enverian company directors and Enterprise Ireland. Enverian has offices in Dublin, London and New York and was set up in 2011. 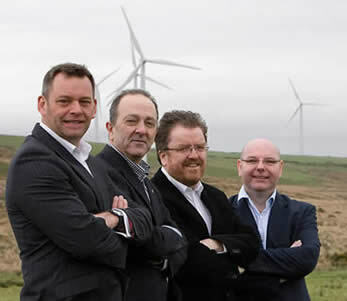 Its software is particularly aimed at the renewable energy sector. According to the company, it has already established itself with several Irish based energy companies and has been able to demonstrate a strong business case for clients in helping them manage a portfolio of pre-construction/development projects either locally in Ireland or on a global basis. The company will be further expanding into the US and European markets in 2012. The €1m investment will fund the commercialisation of a cloud-based system that brings an international standards-based approach to project tracking, ranking and valuing. “Our product, Enverian Portfolio Manager, is the only solution in the market that lets energy companies maximise their investment by capturing real-time project progress and bringing it into the boardroom,” said Enverian chief executive, Colin Rogan. Frank Walsh, a partner in Enterprise Equity Venture Capital, described Enverian as a great example of a young, indigenous and innovative business. “We are delighted to have the opportunity to support such experienced promoters in the exciting renewable energy market where Ireland’s weather for once is a competitive advantage,” he said. Enterprise Equity Venture Capital jointly manages the AIB Seed Capital Fund of €53m, which was established in 2007 and invests in start-up and early stage companies or enterprises based in Ireland which have high growth potential. The fund’s limited partners are AIB Bank and Enterprise Ireland.